After a short course with the Medical Mission Sisters in Patna, Mother Teresa returned to Calcutta and found temporary lodging with the Little Sisters of the Poor. On 21 December she went for the first time to the slums. She visited families, washed the sores of some children, cared for an old man lying sick on the road and nursed a woman dying of hunger and TB. She started each day in communion with Jesus in the Eucharist and then went out, rosary in her hand, to find and serve Him in “the unwanted, the unloved, the uncared for.” After some months, she was joined, one by one, by her former students. During the last years of her life, despite increasingly severe health problems, Mother Teresa continued to govern her Society and respond to the needs of the poor and the Church. By 1997, Mother Teresa’s Sisters numbered nearly 4,000 members and were established in 610 foundations in 123 countries of the world. 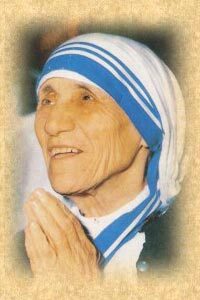 In March 1997 she blessed her newly-elected successor as Superior General of the Missionaries of Charity and then made one more trip abroad. After meeting Pope John Paul II for the last time, she returned to Calcutta and spent her final weeks receiving visitors and instructing her Sisters. On 5 September Mother Teresa’s earthly life came to an end. She was given the honour of a state funeral by the Government of India and her body was buried in the Mother House of the Missionaries of Charity. Her tomb quickly became a place of pilgrimage and prayer for people of all faiths, rich and poor alike. Mother Teresa left a testament of unshakable faith, invincible hope and extraordinary charity. Her response to Jesus’ plea, “Come be My light,” made her a Missionary of Charity, a “mother to the poor,” a symbol of compassion to the world, and a living witness to the thirsting love of God.